I’m not sure if there are words to describe how insanely delicious this dish is. It’s luscious and comforting, but elegant and far from heavy. The flavors play off one another – a hint of heat balanced by a dash of cream and tangy mustard. I’ve made it with and without mint, and both are good. You can even substitute harissa for cayenne if you like, and I suspect you can leave it out entirely and it would still be incredible. I added more harissa than the recipe called for, but I think it all depends on your harissa and your taste buds. Since I made this twice and barely changed a thing, I’ll just let you head on over to Dinners and Dreams (and then in turn to the Boston Globe) to get the recipe. Nisrine gave me her blessing to post my photos and direct you to her blog. It was just too good not to share! Serve with a generous portion of couscous mixed with plenty of fresh chopped parsley or cilantro. Thank you Nandita! This dish was so good! I am popping in from Celi’s blog to say shalom! Shalom 🙂 Thanks so much for stopping by Tandy! An absolutely stunning dish, they looks so flavourful. Lucky that PolaM introduced your blog otherwise I will miss alot of good food posts! Thank you so much Raymund! I’m so glad that Pola introduced us as well! Very easy recipe … I will try when I get back from my business trip! Thanks for the link to get to the details of this flavorful dish-it looks tasty! Also, popping on over to see your feature. You are so welcome! Thanks Tina! Wow, judging by how excited you are about this recipe it really must be amazing! Maybe I should try making harissa myself as well. The best one I have ever tried was ten years ago in Tunisia and none was able to hold a candle to this so far! Haha, yes, I am quite excited about this recipe. It really is that good! And definitely give making harissa a try. You can try to find a Tunisian recipe that will come close to your memory of it. So cool that you got to visit Tunisia! This is another beautiful dish. As always, your photos are just fantastic! Yuuuum! I love these flavors. Sounds like a wonderful weeknight meal! That sounds phenomenal! Saucy spicy chicken is one of my favorite ways to eat it! This looks absolutely scrumptious, and I definitely think I could convince the fiance to try it out. Lots of new flavors for this Southern girl… can’t wait! Oh I hope you do convince the fiancé to try it out 😀 It’s seriously amazing and I know you’ll love it! Oh! I have this recipe bookmarked too! Nice job with this – and thanks for the link to the interview. I’m off to read it! I was looking for a recipe as such. Lots of people have been telling me how awesome moroccan food is, my knowledge is a bit limited to taboulé. Cant wait to try it out. thanks for sharing! Moroccan food is just wonderful!! 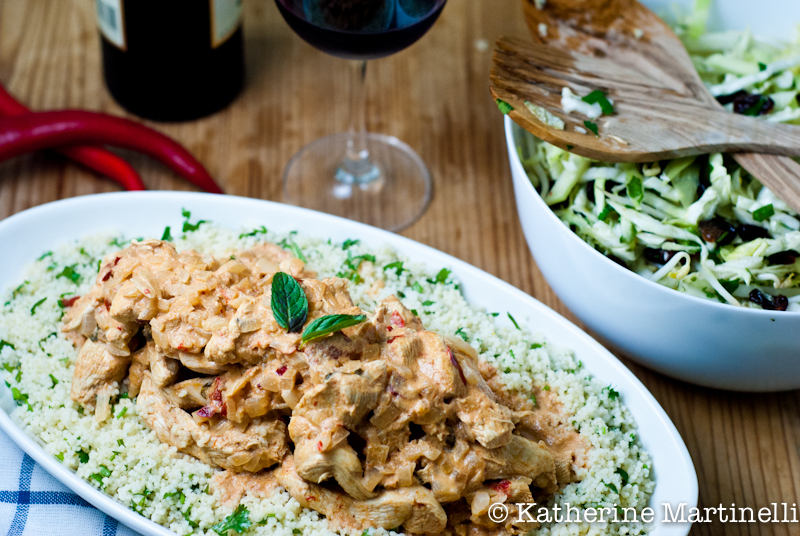 This dish is actually somewhat different from most Moroccan recipes I’ve seen but sooooo good! I really hope you give this and other Moroccan food a try, I know you’ll love it! If I knew this is not spicy at all I would be cooking this right away – it’s hard to tell from the photos and I mean this looks really good!! We’re so lucky to be surrounded by good food blogs where we can try all kinds of new recipes and learn about them. I’m new to Moroccan food so it was fun to read. Off to Maureen’s site! Nami you can easily leave out the harissa and it will still be delicious (and I mean delicious!!) and not at all spicy. Also even with the harissa it was barely spicy since the mustard and cream really counteract the heat. Thank you Janet! The harissa and creamy sauce really are a match made in heaven. Thank you Carolyn! It’s so true, they really are. It’s rainy and disgusting here right now and I could totally go for a big plate of this! Fantastic! Love that creamy sauce…just delectable! That does look like a wonderful family meal. And how fabulous to cook it with your own harissa. The dish looks great to me and I must print off your recipe. Thanks so much! I loved having my own harissa on hand and must make more already. It would also be great with store-bought harissa, or even without it entirely! I usually opt for dark meat to make this type of dish, but with your strong recommentationI will do it exactly as written and use chicken breasts. I love a bit of spice so this is right up my alley. your photos are wonderful! Thanks Anna! I do as well and I love that the level of spice can be so easily adjusted here. This looks so delicious! I loved Moroccan cuisine when I spent time there as a child, and mustard has always been one of my favorites. Thank you for sharing this dish! The chicken is beautiful! I’m also subscribed to Dinners and Dreams….her photos are stunning and very unique! Thank you Ann! Yes, her photos and recipes are just brilliant aren’t they?! Just hand me a fork! Your dish definitely presents this recipe as a real winner and you certainly sold it! Twice in one week – that’s enough for me! Haha thanks MJ! It really is a winner. Seriously, I can’t stop daydreaming about it. Mmmmm… Deliciousness!! I did check out Maureen’s post on you. So nice to learn more about you and your adventures!! wow, this chicken looks so delicious and flavorful! yum! Thank you! It really was, I must say. Katherine, I always enjoy your dishes! 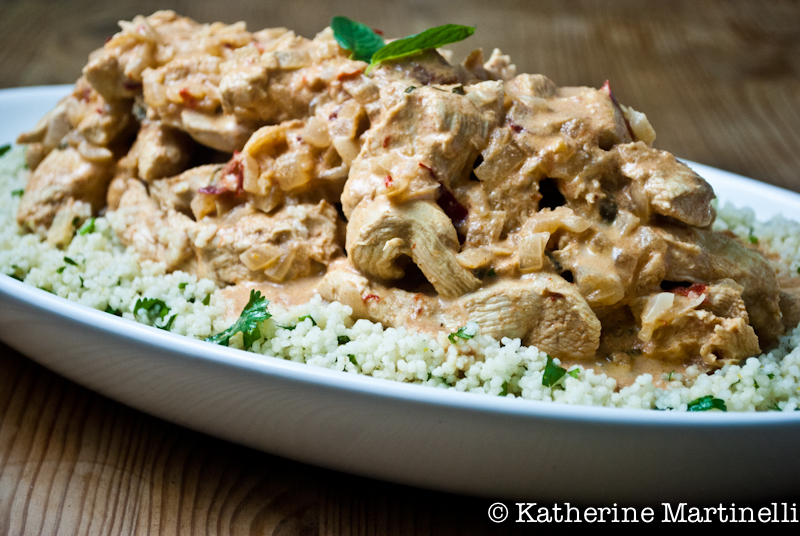 And this Moroccan chicken looks absolutely delicious! Can’t wait to try this, Katherine! I’ve been jonesing for a new meat dish. Thanks! This is a great one to try – I hope you enjoy it!! I love spicy meats! I just bookmarked this. I am so glad to hear it Sophie! This look divine. Thanks for helping me discover another awesome blog! Thank you Dara! And I’m so happy to help you discover Nisrine’s gorgeous work. Beautiful! This sounds delicious. You could say it’s a spicier version of French chicken dijonnaise, which I love.